The Duchess of Gloucester's outing of the Teck Turquoise Tiara this week has put me in a turquoise mood, so let's chat about a tiara that's grown to be rather a favorite of mine. This one was worn by Farah Pahlavi, the third wife and Empress (or Shahbanou) to the last Shah of Iran. It's only fitting that a great turquoise tiara would by a Persian shahbanou; mining of turquoise and decorating with the stone is part of Iran's history, and Persian turquoise is famed for its quality. 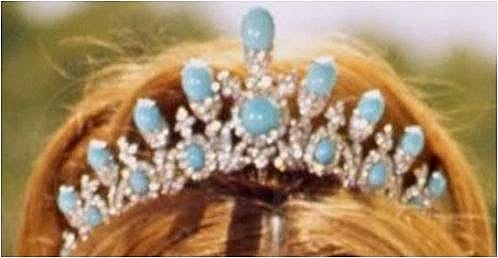 More than one turquoise tiara is tied to the dynasty, but this is my favorite of the known options, like a colorful version of the Antique Pearl Tiara from the Netherlands. The base contains a central round turquoise stone with oval turquoises to the sides in a diamond framework, and a top of nine upright turquoise stones in a graduating height arrangement. A pair of pendant earrings were worn with the tiara, and there was also a turquoise necklace to pair with it. This tiara was made for Farah's personal use, unlike the Noor-ol-Ain Tiara or her Seven Emerald Tiara, which were created as part of the crown jewels and remained with the state when the monarchy was abolished. However, the Empress did not take this tiara with her when she left the country, and today she does not wear tiaras to the royal events she attends. But when it was in use, she wore it to perfection (the high center point made it an especially good fit for the tall updos she sported back then), and it's a shame we don't get to see it today. 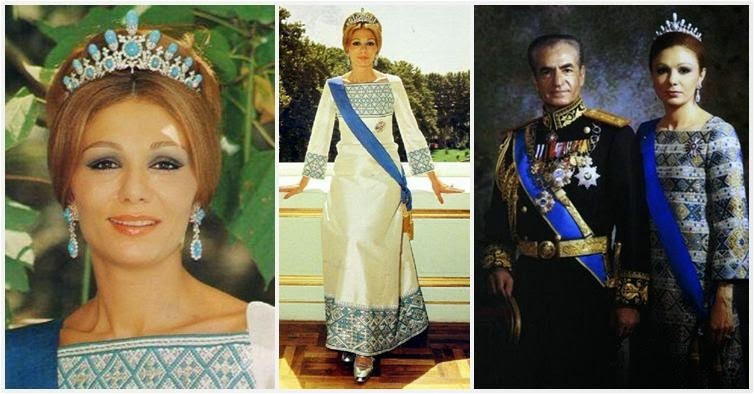 But of course I would say that, since I think it might be my favorite of the Iranian tiaras. Where does this rank on your list of favorite Iranian tiaras?